Well, probably not that sad, really. 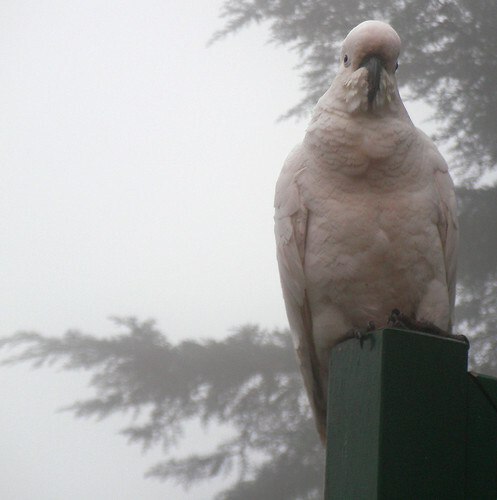 Katoomba birds are used to living in a cloud (as are Katoomba people). They still look all damp and miserable, though, which may or may not increase the amount of seed they manage to scam from us. Taken through a window with the C6. No wonder the seed disappears so fast. 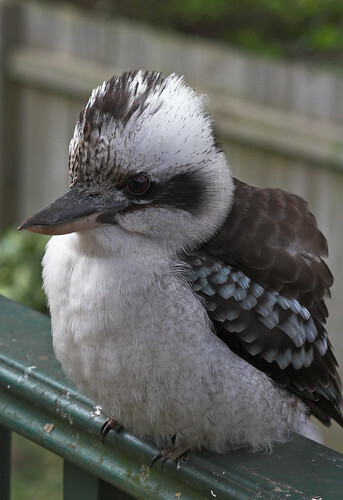 The other day, for no immediately obvious reason, there was a kookaburra sitting on our railing. Birds, we get plenty of. 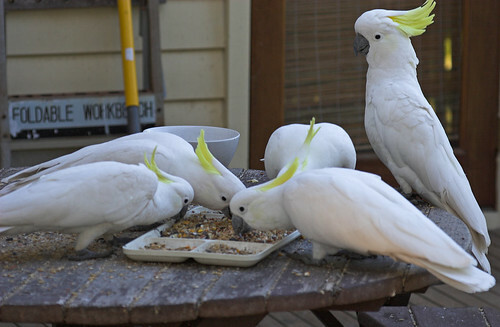 Kookas, we don't, because we don't put out the right food. 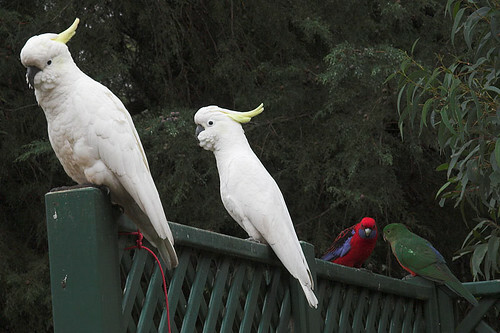 There's a house further up the street that always has a kooka or three sitting on the power lines outside. 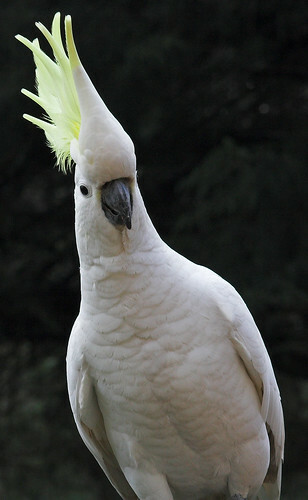 My Holmesian deductive skills lead me to believe that the people who live there feed the kookas. 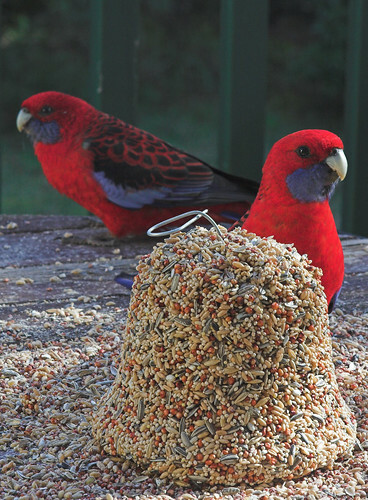 That's easy enough to do; just put out bits of meat and kookaburras, who are happy to eat pretty much anything that's not a boring old plant, will gobble them up. 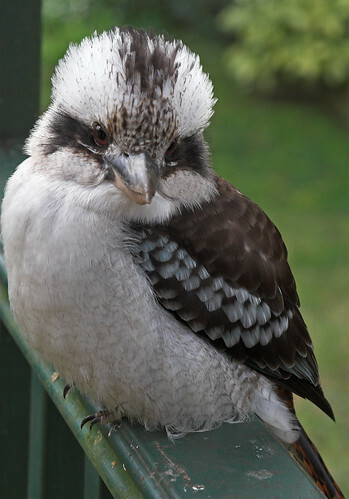 Kookas do not do well on a diet heavy in the steak-bits that humans like to feed them, but occasional meals of pretty much any live or dead animal go down nicely. This one had decided to try our house out instead. 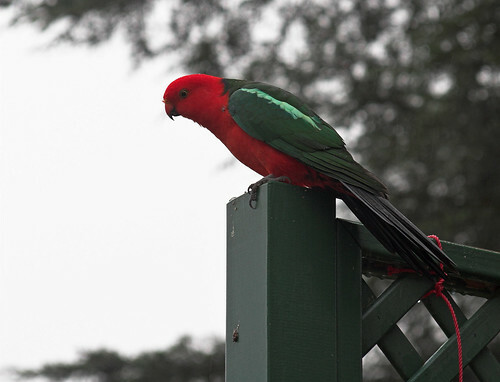 It was a female, I think, on account of the lack of blue colouration on wings and tail. 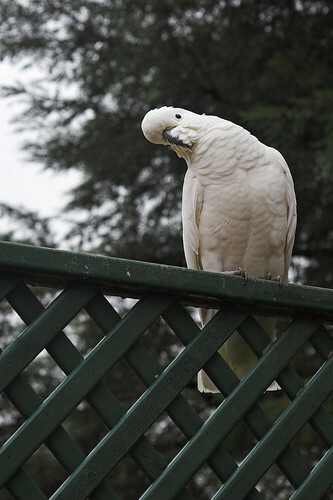 Anyway, I first went out there to snap some shots of the bird with my old-ish 100-300mm. That wasn't as successful as I'd hoped. Oh, I took pictures of the bird just fine. But the minimum focus distance for the 100-300 is 1.5 metres, and I had some trouble getting that far away from this kookaburra. She seemed happy enough with the lens more or less clinking up against her beak. It wasn't really a normal bird-lens kind of situation. So I switched to my cheap Phoenix macro. 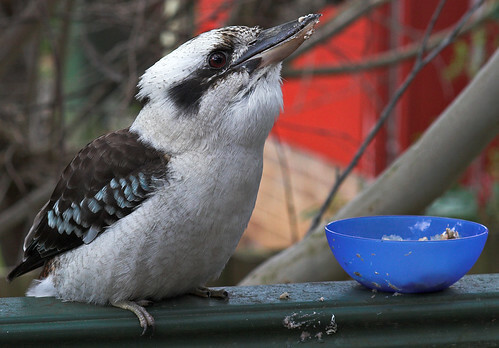 Many kookaburras have been hanging around people long enough that they'll eat out of your hand. It's up to you to decide whether that's a good idea. 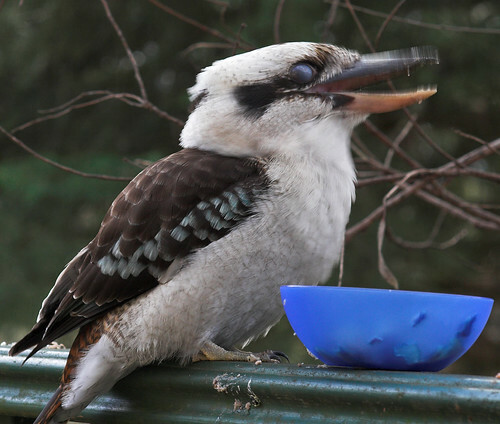 I took a lot of pictures of this kooka, then figured I ought to say thank you with at least a bit of food. Nothing in the pantry really screamed "kookaburra food", but there was some cat food with fish chunks, which looked like a decent bet. It met with her approval. I initially tried offering her a spoonful of it. I only just managed to get the spoon back. 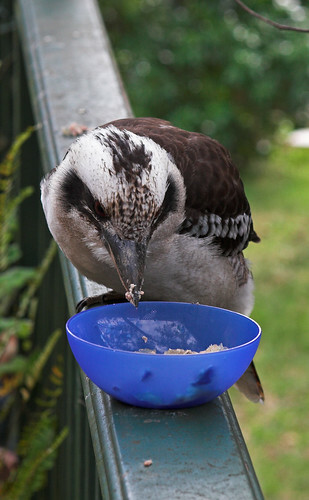 Kookaburras aren't really built to eat cat food, even the lumpy kind. So a significant amount of the fish ended up just messing up her beak. And the railing. 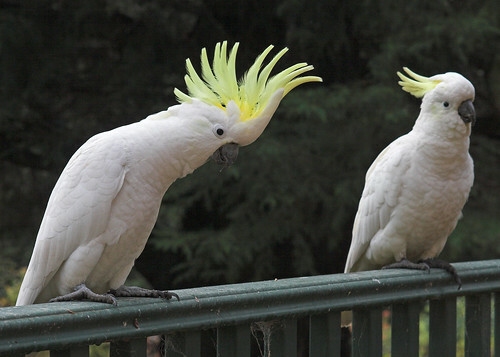 That was because kookas instinctively beat their food on hard objects, to make sure it's dead. They do this with any food you give them, which means you'll get sprayed with tiny bits of fish if you give them cat food. 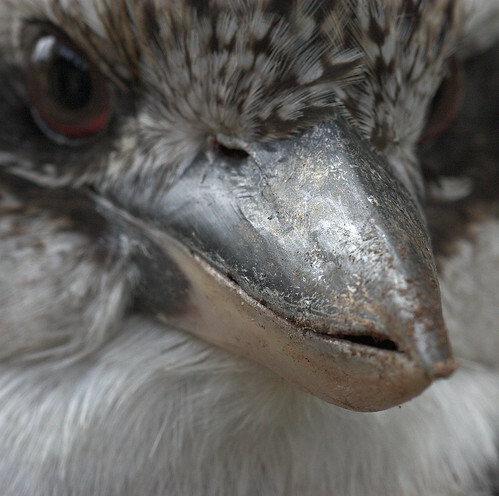 Kookas also, like other birds, have a nictitating membrane, or "third eyelid", which they deploy to protect their eyes when they're doing something dramatic, like bashing their food. 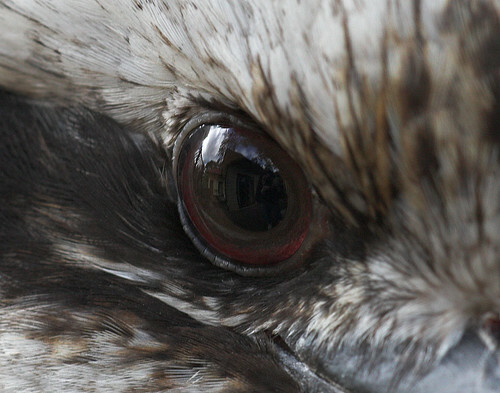 The translucent membrane gives the bird a dead-eyed zombie look. Cats have third eyelids too, but they at least have the decency to close their outer eyelids before they close the membrane, so you usually only see a bit of it retracting away as a sleepy cat opens its eyes. If you see a cat with its eye mostly open and the nictitating membrane clearly visible, then it is probably not a healthy cat. 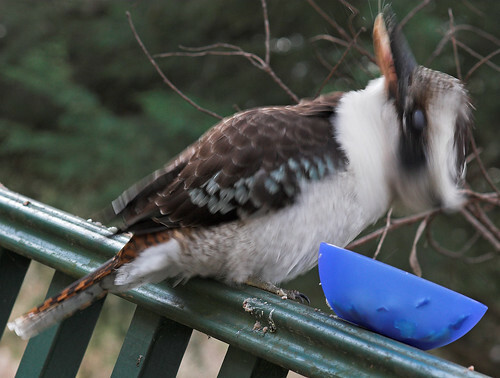 The kookaburra hasn't been back for another feed. I presume whatever they're getting up the street is better.